For me, it all started six years ago when a Canadian sketch comedy team called Loading Ready Run (LRR) was hired by Wizards of the Coast to produce an online web series. Called Friday Nights, the series instantly became a fan favorite with the LRR audience, even those people like me who had heard about Magic: The Gathering but never played it before. A year later, I found myself at Universe Games in Minneapolis participating in my first ever Friday Night Magic tournament and ended up winning only one match. Financial difficulties prevented me from returning to the store more frequently for more booster packs and tournaments. However, every now and then when I had the dough, I’d run back there or to my new local game store, Dreamers Vault, for booster packs of the expansion sets I hadn’t picked up earlier or to play in a prerelease event where nobody really knows how the cards will interact with each other yet. One of the things that’s kept me from being a better player is the fact that in all five years I’ve been playing, I have not played with current cards and expansion sets consistently. It’s hard to justify spending money on individual cards to build a powerful Standard-format deck when you don’t even know whether you can afford to play in a tournament on a week-to-week basis. Medical issues also prevented me from going to the store with cards for a Modern or Commander deck on weekends to just sit around and play with other folks on a casual basis. Wizards of the Coast does have an Internet-based game, Magic: The Gathering Online, which players around the world can use to play when they can’t go to their local game store, but the same lack of pocket cash is a limiting factor. Enter Magic: The Gathering Arena, an upgraded version of Wizards’ previous free-to-play versions of Magic (Duels of the Planeswalkers, Magic 2015, etc.). Everyone who downloads the game (PC only so far) will have access to preconstructed decks containing cards in Standard, and for less than $5 more, players can purchase a welcome bundle that comes with additional in-game currency as well as some additional powerful cards. However, a person wouldn’t need to even spend a dime to play the game, as there are daily quests one can complete to earn gold; this can be used to buy additional booster packs and/or enter tournaments and events for the chance to earn more currency, cards, and wildcards that can be traded on a one-to-one basis for cards a player hasn’t collected yet. Armed with the welcome bundle alone, for the last two months I’ve played in the closed beta for Arena both on my livestream for the world to see and by myself. I’ve lost many games, but I’ve also won enough and completed enough quests to amass a lot of gold and extra packs. I’ve been able to buy my way into a competitive draft at least once as well as play the weekly one-on-one regular draft gauntlets and the fun formats such as Constructed Singleton and Momir Basic. I even created an account on Tapped Out, a site where both veteran players and absolute newbies can post their deck lists and seek advice on them as well as read other deck lists and attempt to create their own versions using the cards they have. The more I played, the more I realized that in addition to being a game, Magic: The Gathering Arena is also a tool for casual players like me who want to improve. I found that it was easier for me to learn how mechanics in Standard work by picking a deck that looked fun, importing it from Tapped Out into Arena, and attempting to duplicate its effects with the cards I’d opened. Before it rotated out of Standard, I taught myself how the Energy mechanic worked in Kaladesh and Aether Revolt by copying a deck made by a Tapped Out user (Cosmonaut_Kitten) and subbing in many more Blue/Green Energy-making creatures as well as adding Vivien Reid because I love using Planeswalkers. That became one of my best-performing decks, if by best-performing one would count winning two out of every seven games—and I do. Another deck I ended up loving so much because of how silly it is was this 5 Color Horse deck I copied from a user named pyroplasm. They even gave me suggestions on how to make it into a stronger deck without the Kaladesh and Aether Revolt cards; I’m sure I’m bound to ask them for advice again after the Guilds of Ravnica prerelease this coming weekend. This deck has gone 2–3, but when it wins, it becomes the most ridiculous thing imaginable. 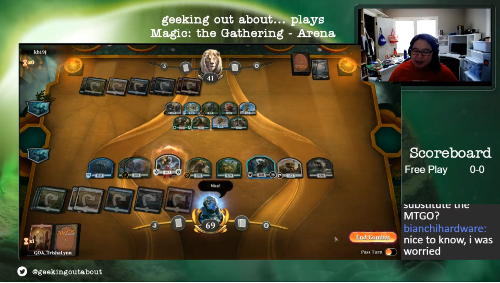 Livestreaming Arena has also helped me become better as a casual player by forcing me to talk through my decisions on which cards I’m playing, which in turn helps me become more confident about the plays I’m making. As I don’t currently have an audience, this results in me talking to myself a lot, but at least I’ll know that I don’t sound dumb when I go to a live tabletop Magic event and can talk to and with my opponents. Because of my experiences, I am superexcited for the Open Beta, which starts on September 27, 2018—I’ve already predownloaded the updated client. You can download and create an account for yourself on the Magic: The Gathering Arena website. Trisha started writing about feminism in geek spaces in high school and hasn’t stopped doing it yet. A former editor for Sequential Tart and Wizard: Anime Insider, she now writes about the intersection of various geek spaces here and on her own blog, GeekingOutAbout.com. Finding a regular playgroup for casual games can be tough, I know. I hear, though, that someone is trying to start another Lady Planeswalker Society chapter in town; if they do manage to get it up and running, that might be a good place to start.